Yesterday, Sunday 31st May I went for my first long training run, the first of many. To be honest I don’t know many places where I can go on a long run off-road despite living in a semi-rural part of the country. This is as much to do with my knack of just getting out there and running or walking but not taking any notice of where I’m going as anything else! However I do know Haworth, the world famous home of the Bronte’s and the moors are said to have provided the inspiration for Emily Bronte’s novel, Wuthering Heights. 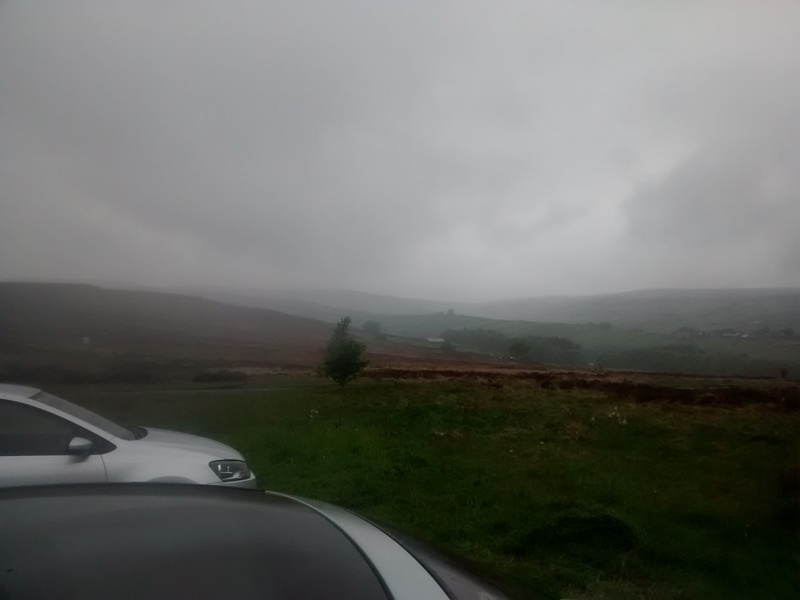 I have walked these moors many times myself and so they are an ideal place for me to start my off-road training as I know the paths and trails and can vary my route every time. But I didn’t have time to sit there daydreaming; I had a training run to do! So off I set on a familiar path to the Bronte waterfalls, Top Withens, then the Trig point on top of the moors and finally Alcomden Stones. This is around 3 ½ miles but always seems a lot further. The route starts off on trail before turning to rock and mud and then finally open moorland above Top Withens and on the way to the Trig point and Alcomden Stones. Today though extra care was needed as the route was slippy and muddy because of the rain but I still made good progress up to the Stones getting there in around 45 minutes. Alcomden Stones are an outcrop of ancient stones allegedly where prehistoric men worshipped. I think it is a spectacular place simply because it is one of the few places where you can go and experience freedom from all the stresses of modern day life. There is nothing around for miles and you can feel free here. But when you get here you also have a problem. You can go back to Top Withens on the trail that is easy to navigate or you can try and get down to Ponden Kirk. The problem here is that the trail runs out and you are left on open marshland and bog with no clear path. I of course took this option and followed the stream as closely as I could. If you follow a stream you will eventually come out at a point where you will be able to make a more informed choice of route. I knew though where this stream came out but this did not make the run any easier. My feet got soaking wet standing in water and covered in thick mud as I made my way as quickly as possible across the marshland. But I enjoyed this, far more than I enjoy running on roads. This for me is true, pure running, in the wilds with the elements against you and you need all your wits about you to avoid coming a cropper and taking a wet and muddy fall! Back up to the top path and having avoided falling I ploughed on down towards Ponden Reservoir and on to the path that would take me back up to the waterfalls and the path back towards my car. Apart from getting a bit lost the rest of the run was uneventful but satisfying as I was building up my distance training now. That was apart from on the path from the waterfalls back to Penistone Hill. The path is narrow in parts and strewn with rocks, but I had a group of older hikers in front of me that were slowing my pace. To get round them I took some risks and jumped over and off rocks with a pace and agility that surprised me! The best moment came when one of them said ‘there’s a fell runner, bloody idiot!’ I took this as a compliment! Nobody had ever called me a fell runner before! And 9.3 miles later I was back at my car. Feet soaking, dripping wet, muscles already aching, tired but having an immense feeling of satisfaction and achievement deep inside me from having achieved so much more in my first proper training session than I thought I could. I already have a route in mind for next week. But that’s another story.